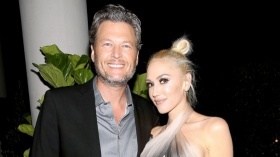 Gwen Stefani accepted top honors last night at Glamour’s Women of the Year Awards and she made sure to give her boyfriend, Blake Shelton, a sweet shout-out. She also thanked her parents for instilling confidence in her as a kid. “I just want to say that I was on my way here, driving, by myself in the limo, and I was like, ‘What! How did this happen to me? How did I get here? How did this happen this year? '” she said.